Much of our work is to ensure the populations of stickleback species pairs remain healthy and vibrant. One of the greatest threats to stickleback species pairs is the introduction of foreign plant or animal life. In Hadley Lake on Lasqueti Island, the sticklebacks were driven to extinction by the introduction of brown bullhead catfish. In Enos lake on Vancouver island the two species have collapsed into one hybrid swarm. It is thought this was caused by introduced signal crawfish chewing up the lake vegetation and turning the lake waters cloudy - preventing the stickleback species pairs from seeing the visual colour cues needed for mating. It is felt many other foreign species such as european milfoil would likely also drive the species pairs to extinction or species collapse if they were ever introduced to these lakes. Just as signal crawfish probably collapsed the species pair in Enos lake by increasing lake turbidity, it is thought anything else which increases the cloudiness of the lake water is also a threat to stickleback species pairs. A washout during stickleback breading season could cause a significant hybridization event. Risk analyses have been done. High risk areas within local control have been corrected. 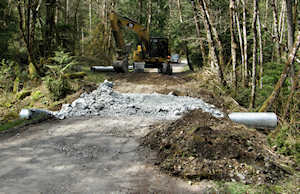 Such as the high risk road crossing culvert being repaired here. Texada Quarrying has installed settling ponds upstream. Stickleback Recovery Planning site of Michael Jackson for Acroloxus Wetlands Consultancy - Texada Stickleback Groups Director and one of our main ecological consultants. An older, but still fairly good Pamphlet from British Columbia Ministry of Environment on sticklebacks and the risks to them. 2004 article in the Mondaq News - Canadian Species At Risk Act (SARA) coming into effect. see: Guidelines for the Collection and In Situ Scientific Study of Stickleback Species Pairs (pdf).